Fixed-blade knives are a staple of the outdoors. With this entry to the US market, Hultafors offers a versatile design at a value price. Hultafors is a 140-year-old Swedish brand that is recently pushing sales into North America. Known for axes and tools abroad, the company now adds a few fixed-blade knives imported by Sport-Hansa to the U.S. market. 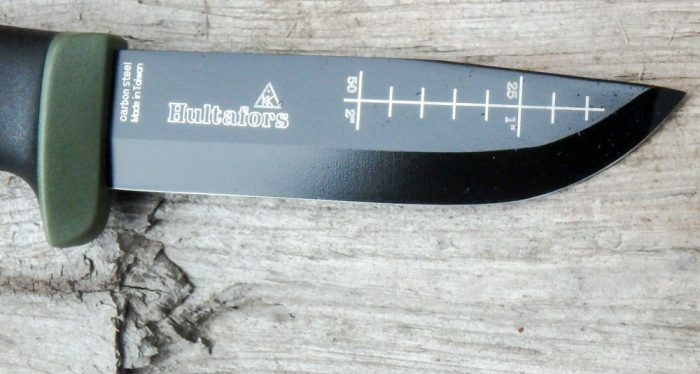 Hultafors doesn’t redesign the fixed blade, but provides a solid, useful knife at a fair price. I looked at the Expedition Knife for this introduction to the brand. 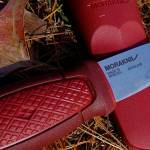 Pick up the Hultafors, and the first similarity that pops into mind are a few models by Morakniv. The rubber handle, scandi-ground blade, and lightweight but robust design harken to the competing brand also from Sweden. But with Hultafors, you get a made-in-Taiwan version that has some slight deviations. 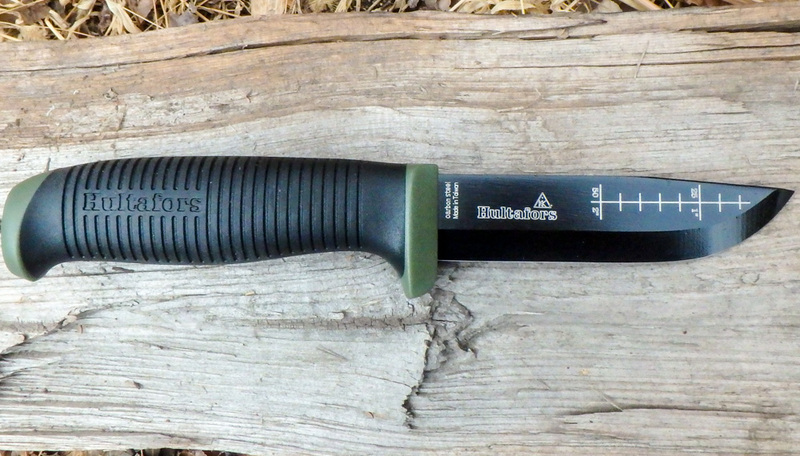 It’s worth noting I only used this knife for a couple days, so this review is just a first look at the model. 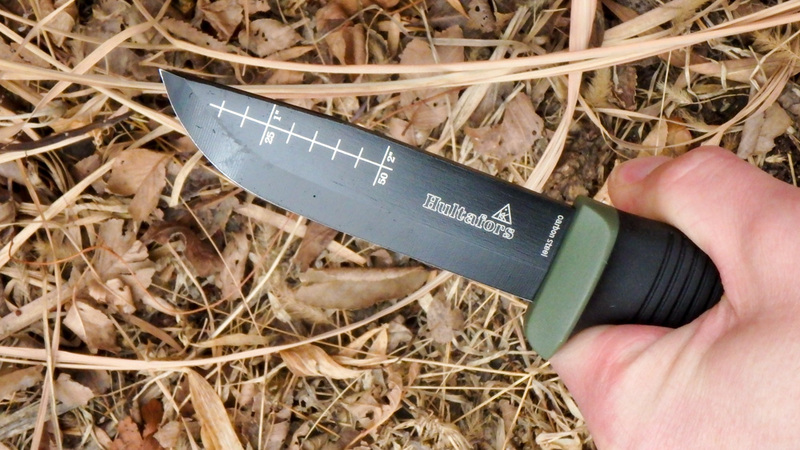 The Expedition Knife uses “Japanese Carbon Steel” hardened to 58–60 HRC. The 4″ blade has a nice versatile shape with a very slight drop point. It has a steep front curve that gives it a lot of strength, and helps with pushing and pulling tasks and carving. The 0.12-inch thick blade has a square spine for use with a ferro rod. The flat grind makes for an easy-to-sharpen blade. 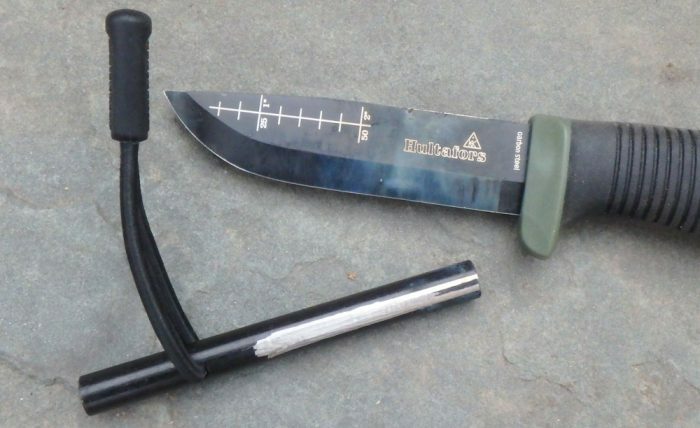 The knife has a 3.2″ tang, which brings it most of the way through the handle. While not a true full-tang, the knife seems pretty rugged. The soft rubber handle has a moderate palm swell that sits nicely in the hand. It gives a secure grip and feels comfortable in many different ways for various tasks. While a bit burly for kitchen work, this knife will certainly do an OK job of slicing onions. But where it should excel is heavier work. I whacked it through a few logs, and the batoning session did no damage to the blade or handle. It did, however, scuff off the protective finish. You could probably kiss the nice black coating goodbye after a handful of hard-use sessions. The unique inch measurements on the blade, which could come in handy from time to time, seem slightly engraved and would probably last quite some time even if the coating wears off. 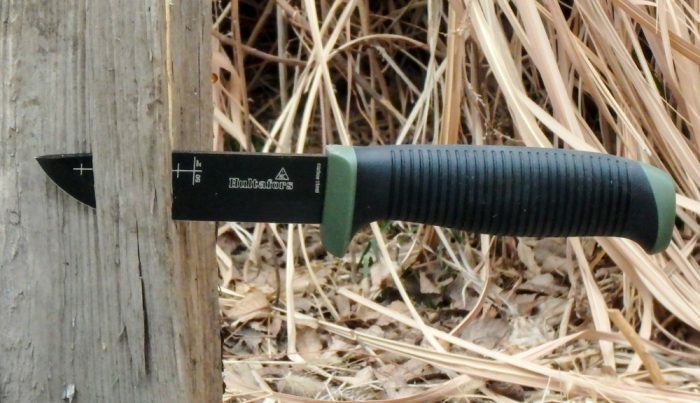 The plastic sheath is basic but well designed. The knife fits firmly inside, draws with a hearty tug, and sits comfortably on the hip. It’s a light blade (3.7 oz on a postal scale), so not one you’ll feel even after a full day of carry. The sheath has a very large fabric belt attachment. I’m keen on the style because it fits easily through wide belts (up to three inches) and allows the sheath to move freely with your body. The sheath also has a nice holder for the Hultafors fire starter, sold separately. The fire starter sits perfectly in the sheath, and as a $20 add-on, it’s a nice emergency device to have with you at all times. In a few short days, I’ve enjoyed the knife’s utilitarian design. It will be a good choice for those who want a single knife to take into the backcountry and accomplish a variety of tasks. While not a true full-tang, it seems tough and capable of jobs from fine carving to batoning to food preparation. 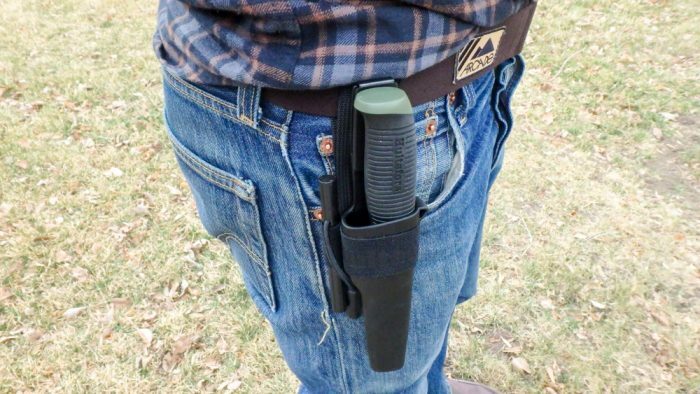 The sheath is good and makes carry a breeze. For the price, this is a good knife that will serve its user for quite a while. And for under $40, that’s a value that most campers, hikers, hunters, or anyone venturing away from the trailhead should consider.